Now you can easily create perfect circles, ellipses and sweeping arcs! 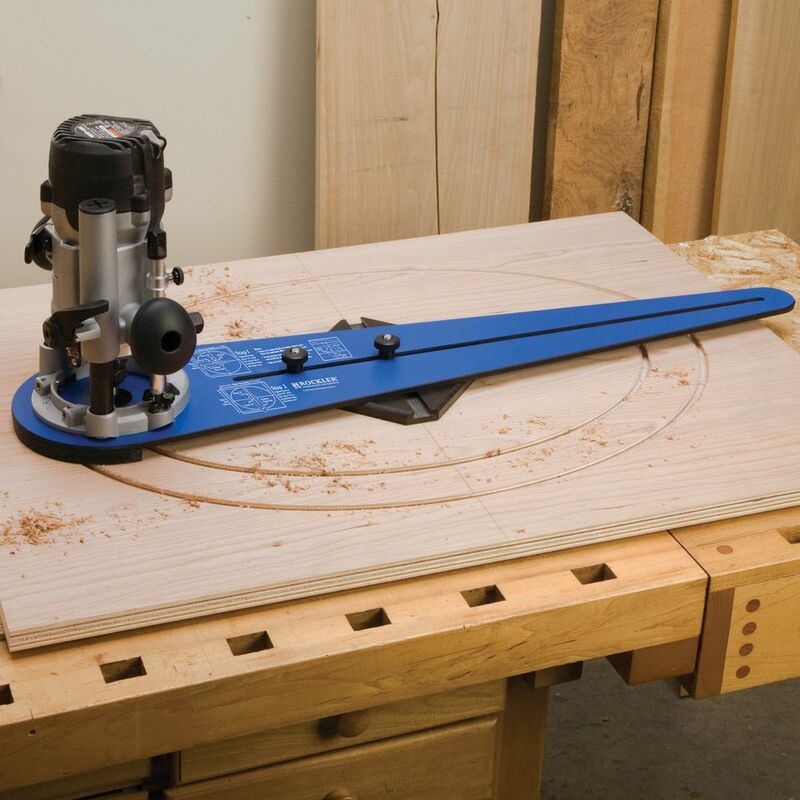 The Rockler Ellipse/Circle Router Jig lets you cut circles and ellipse shapes over a wide range of dimensions and proportions. With your router and this handy, easy-to-use jig, you'll be able to make picture frames, mirrors, signs, tabletops and more in just a matter of minutes. Compare to other ellipse/circle router jigs that cost $100 more. Set up takes only a couple of minutes and is virtually math-free. Using the jig is just as easy. 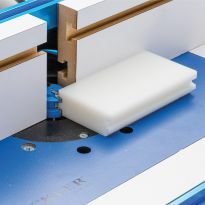 As you move the router through the cut, the jig's sliding dovetail mechanism keeps the router precisely on the cut line. Designed for use with just about any plunge router. 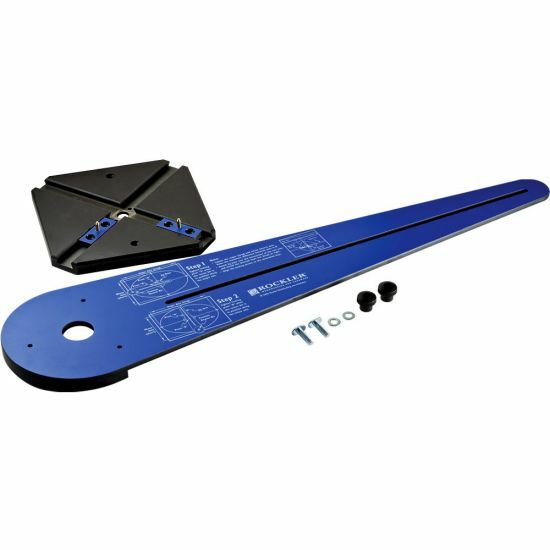 Maximum length for major axis is 52"
Maximum difference between minor and major axis is 8"
Minimum difference between minor and major axis is 3-1/2"
Easy to setup. It maintains its settings and diesn’t drift. Have made some good money using this tool. Handy jig every craftsman should have! I make signs as a hobby and sometimes for profit. Before purchasing this jig I did like most cut the ellipse with a saw and sanded the edges which was a lot of work. This truly has improved the quality of my work and reduced the amount of finishing time. Great. Cut a perfect ellipse the first time I used it. Took a little testing to get the ellipsis I wanted and once I got the technique it was easy to do and replicate. I cut two perfect 42” ellipsis for two twin beds headboards using the jig and large base. After a few trial runs, love it. I looked at some of the reviews and I sure do not have the same problems. Mine is really very well made. The slides work quite smooth. I have no problems what so ever with this tool. It has made my wood sign making so much easier. Thank you. Bought both items for husbands Christmas. I'm sure he'll be thrilled. Extremely happy with the design and functionality.. This product did exactly what it is design to do. I have not cut and ellipse yet but I am feeling confident it will work. I used it for the first time to cut a 30" diameter circle. It easily did the job. The only negative is I had to drill new mounting holes to mount my Craftsman router. Not a big chore. 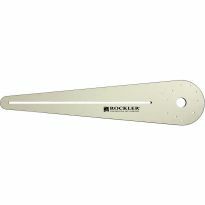 Didn't want to take the time to make an ellipse jig so I ordered Rocklers. Cut a perfect table top on the first try. Some reviews mentioned some slop that would ruin a project. I did not have any deflection or slop. I am fairly new to woodworking and so was hoping this jig would help me with the project I had in mind. It worked perfectly once I figured out how to use it. I did wax the grooves first, since I had read thru all of the questions before purchasing and that seemed like a no brainer. There were no instructions in the box, only the ones on the jig itself, but there is a manual on the site that I downloaded and from there easy peasy! I recommend it. My wife wanted a 4' diameter table top cut out of birch plywood for one of her many wood burning (pyrography) projects. What I had been using for a circle cutter did not work well enough for her needs. I have the smaller version of this jig so I know how well it works, so when this larger version came out, I grabbed it and put it to work and in less than 30 minutes, I had her table top cut out, sanded and ready for her to start working on. When she completes this project, it will become the focal point of her studio. Very nice jug for my needs. Could not line up holes with my router base so I double-faced taped it to the jig and it worked easily. Works like a charm. I used it to make a picture frame,for a 15" dia. mirror using a round table top blank. Very easy to set-up and my PC plunge router base mounted right up. A true money making gadget ! Had this product before and used it many times to produced arched top book shelves and cabinets. Moved my shop and lost/broke some of the pieces in the process. So this is my second purchase of this product. My shop doesn't produce arched top cabinets every day, but when we do, this is the "go to" tool to get the job done. Very easy to use. Accurate. High quality. Thanks for the quick service. Several small pieces were missing and a phone call got me everything i needed. I think I will ove my new jig. This jig works great. I was surprised how smooth it glides elispes. The holes on the jig did not line up with any of my routers ( I have a Triton, Makita and Ryobi) so I had to drill new mounting holes. After a little mounting work it works spectacularly. This tool is easy to set up and operates flawlessly. Worked great, easy to use. It worked just the way I had hoped helping to create multiple and various radios templates. Worked great. Was a big help! This jig works great! 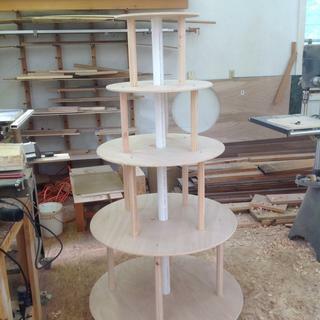 I have cut circles and ellipses with jig and the setup is quick and easy. I had to modify the router base to fit my Craftsman's, it took about 20 minutes. I recommend this product to anyone that needs to cut ellipse or circles. I have only used it once, but like how it performs. The jig works great, easy to use, no problems at all. Wish I could buy a larger base. I've been working on a compass rose floor medallion for a house I'm finishing up. I needed to cut a perfect 36" circle from 7/16" plywood to mount the laser cut pieces of the medallion before installing it on the floor. The plywood circle really needed to be 36" +/- no more than 1/32". I started to just make my own, but time is of the essence on this project. Rockler offered this jig at a sale price too good to pass up. Using this jig I was able to nail the plywood circle at an exact 36" the first try! The jig did need some modification to match the base of my Bosch plunge router, but it was very easy to retrofit. Can't wait to cut some ovals with it! Great product. Well made and worth the price charged. Very smooth jig. This will be outstanding tool in my shop. Easy to use. Worked just like promised. I'm sure that is works great with a router, but I modified it to work with a fine pen, so that I could create oval frames for my Intarsia patterns. I also added a stick-on tape to give easy repeatability. My husband uses it and says he is very good, it strongly recommended. Very well made item. Does not require "space technology" to be made - simple and proper working tool which works great for reasonable price. Can be made by any woodworker but instead of spending time for jig making you can buy this one and enjoy actual woodworking. Thank you! I bought this jig together with extra base for big circle/ellipse making. 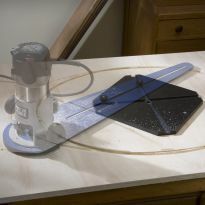 I recently bought the ellipse jig to use with my Porter cable router for picture frame, oval, round top tables and signboards. It works extremely well. I purchased this jig for custom sign shapes for my sign carving business. The instructions were very clear and easy to have for reference right on the jig. After playing around with the jig on some scrap plywood, I gave it a try. I used a 1/2 inch spiral upcut bit in my plunge router and made gradual cuts in 1/4 inch increments. Very easy to use and made a perfect oval! Just take your time and take some practice cuts before you make a formal cut. The jig is very high quality, sturdy and fits my PC 890 series like a glove. I am using it again on a large custom sign and am looking forward to it. Great tool! I recently bought the ellipse jig to use with my Rigid Model 2930 2.25HP plunge router. I routed some oval tables out of plywood with a finished oak veneer surface. I used a half inch spiral upcut bit, which left no splintering. I had no problems attaching the jig to my router and it worked extremely well. You do have to make sure you have a good workbench and that your work and ellipse base are firmly secure. You also have to make sure your router power cord does not get tangled. I was able to consistently route out seven 18x36 inch ovals and was very happy with the results. Whoever invented this product is a genius. I was a little apprehesive about how smoothly this jig would perform because there is so much that has to go right to make it work. I was very happy with the performance and the end result. Set-up was a breeze, and it fit easily on my Hitachi plunge router. I had to cut an eliptical opening out of a trash container top and it turned out perfectly. Thank you Rockler! I made this jig 2 years ago in my shop. Pretty much the same design Out of 3/4 lexan, wish I would have known! But keep up the great products! This is an excellent jig. I have been building fine furniture for years, and you need to use the tool for which it was designed. I took this out of the box, and cut a 36&quot; circle from 1&quot; hard maple. It took 4 passes, but the top came out beautiful. Not done, I then attached a 1&quot; bull-nose bit in my router, and used the circle jig to cut the bull-nose. 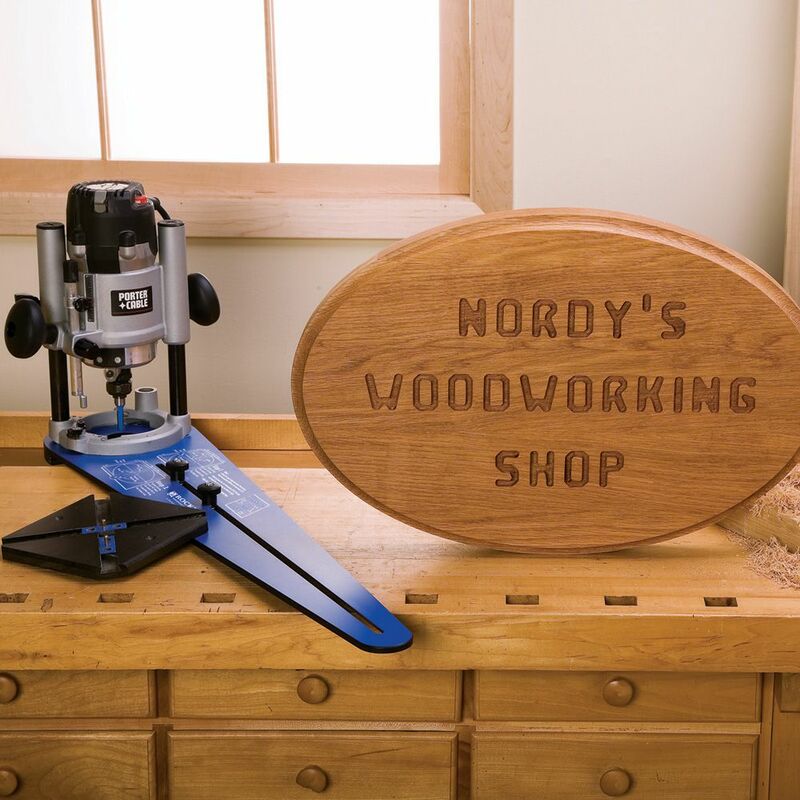 This is from Rockler, a company who designs tools for the home workshop. Again, stick with using the tool for which it was designed, you will never be disappointed! I bought this jig and last weekend cut my first circle using the jig and my router (EVER). The jig is very easy to use and the table top turned out GREAT. This will make a addition to my shop. want to try some things. I do not believe he has one of these and the reviews were very positive. winter work in the cellar. Have used a homemade jig in the past. Decided to try this jig to see if I could get better results. I need something to cut the round in smooth cut. It is what I am looking for small and large size. To make round and oval frames for my wife's stained glass projects. I needed something dead on accurate for circles and ellipses and this fits the bill. Needed a good jig. It worked really well when I used it. To enhance router options in the shop. I need this to make around 100 tables for a restaurant. I want to make a wooden Frisbee. This will be used for sign making also picture frames with some carving on them. The oval is something I can't do at this time and this will make it so much more simple and faster. Thanks. I have some really old pictures of my mother in the ellipse frame from back in the early 1900's and I want the create a frame to put a picture of my Dad that would match. Since my mother died when I was born and we never got to meet this would be special to have them framed up together. T0 use to make oval picture frames for my wife who paints. 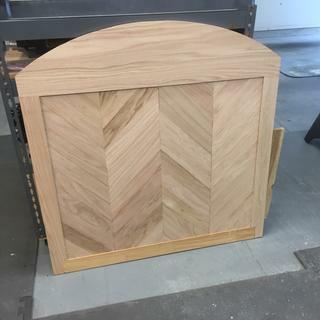 I want to be able to cut larger circles and ovals in making dining room tables. This jig will help me do that. Needed for home workshop projects. Basic tool for ellipse /circle building. Needed a quick way to cut out perfect circles, larger than my other tools could easily handle. what is the smallest minor axis and major axis the elliptical jig can make? will this work without a plunge router? can it be modified to make a larger ellipse (6' 7" major axis)? I have a Triton TRA 001 Router will the 27712 circle jig fit? BEST ANSWER: The pre-drilled hole locations won't match, but you can drill the jig base to match the router. will the jig work with bosch routers? BEST ANSWER: yes it does..i personally use a bosch with it. Thanks for the info. I saw other comments on another site that said it wouldn't. Thanks again now I will order one! What model Bosch do you use it with? I'm ready to buy this but now I'm having doubts after reading the reviews... however the reviews are a few years old and I'm now wondering if Rockler made the necessary upgrades...I have a Bosch 1617 ESVPK router combo.. Thank you for you input. 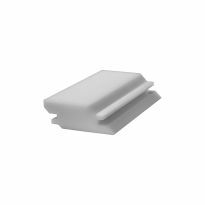 Which mounting holes did you use in the base? I cannot figure out the orientation. 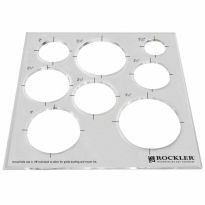 i bought a rockler ellipse jig and i went by the directions. every time it jams up in the dovetail groove. do i need to wax the groove? BEST ANSWER: Yes, waxing the groove can help this. If dovetail keys still seem too tight then sand them slightly on the edges. Bosch 1617 plunge router that has ~ 6 -11/16" dia. base: i.e. can this jig be drilled to accommodate this popular model? BEST ANSWER: I think you will be fine the end that holds the router is 7"
I have no idea of your hole pattern on that router, but I have a 7 inch wide PC plunge on mine & it works great. Mine is still in the box. I have a Skil 1823 will it work with that? BEST ANSWER: I cannot say for sure, but I own multiple types of routers and it has worked with each and everyone of them. I would think the Skil 1823 would be the same. will the predrilled holes fit the Porter Cable 890 Series? Hi do you have this jig in the UK? Shipping options and costs will be displayed in the on-line checkout based on the items ordered and your complete address. You will not need to submit the order to view these, however you will need to add the items to your cart and then go into checkout to enter your address info. We regret that we will not be able to calculate any duties, taxes or brokerage fees that may be due at your end upon delivery of a shipment. What is the recommended method for attaching the jig to the workpiece? The jig appears to have screw holes pre-drilled, but no screws were provided. BEST ANSWER: It has to be screwed down. Do your work from the back side or you will have holes to fill. Thanks. Just a bit odd that they make no mention of this in the instructions. I guess if I'm using thin stock I'll have to use double-sided tape. how do you keep the discard piece from dropping and thus interfering with the router path? Hi, do you know if the DEWALT DWP611PK router will work with the pre-drilled holes? BEST ANSWER: I'm so sorry to say that I have not had the time to use the circle guide, nor do I own the router in question. No, I have a Porter Cable and a Boch. You may have to drill holes. 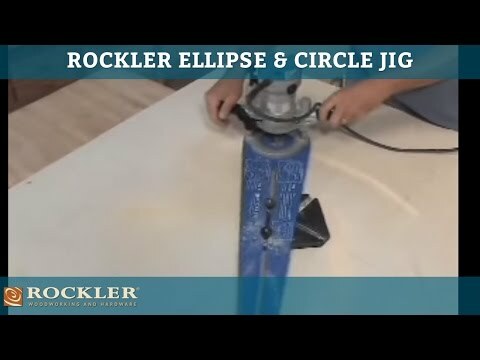 What is the main difference between this jig and the other Rockler circle jig that sells for 40? Is it that this one makes ellipses? The product is very good as are other jigs from Rockler. I have never tried an ellipse that size so I couldn't give you a positive answer. How do I cut circles? There are no directions or instructions with the jig. 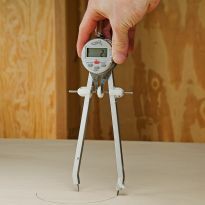 BEST ANSWER: To cut a circle with this jig you only use one of the sliding pins and fasten it down in the center with screws. On this page of our website you can find the instructions on the right hand side of the page just down from the top a bit under the header of Technical Downloads. The last square show how to cut circles. lock the slider at center. What size / style bit are people using with this jig? 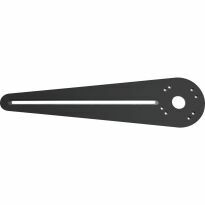 BEST ANSWER: All of my bits are 1/2 inch shank and if I am just cutting a circle I use a straight bit anywhere from 1/4 to 1/2 inch in diameter. I have found that if the material that I am cutting is more than 1/2 inch thick, I make cuts in several different depths. It is much easier on the router bit and prevents burns in hard wood. I use at least a 3/8 and more often 1/2 inch plunge straight bit. I plunge equal to the diameter until I get through the project. Hope this helps, Beverley. 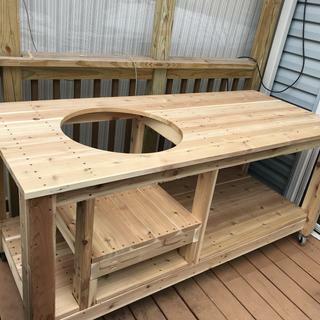 Interested in purchasing this product, I'm new to woodworking have a bosch router but wondering what type of router bit you would use to cut wood out with? what is the maximum radius for a circle? BEST ANSWER: The max radius is 52"
The description says the max diameter is 52", which would be a max radius of 26". Sorry, 26" is the max radius. I lost one of the keys, can parts be ordered for this? can i use a regular router or does it have to be a plunge router? I don't have a plunge router. BEST ANSWER: Read the list of compatibile routers. I had 4 different routers and I thought one of mine would match the pre-drilled holes. I had to buy a new one, which I don’t mind, less bits and tools to change out. If the holes match and you can adjust the depth of your cut, it will work. For a clean cut you need to be able to take it in small increments to avoid tear out. Theoretically you could re-drill the holes in the jig to fit your router, but unless you are spot on, your cut will be off. Best bet is to have a router off the compatibility list in the description. will it make a 24x48 in. eclipse table top? BEST ANSWER: yes this jig should be able to make the elispe you are looking for. 52 inches is the maximum diameter circle. BEST ANSWER: T bolts have a chamfer to allow bolt to lay flush in the T block which I believe is threaded. 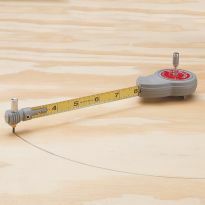 I absolutely love this jig especially for use in oval frames or large diameters. I have built my own in the past but it didn't near as smooth as this! Thx Hope this helps!! will this jig fit on a festool router like OF 1010 or OF 1400? Will a Bosch Colt Plunge router fit the base or is it a case of drilling the base to fit the router? Will this fit a Trend T11? BEST ANSWER: I'm not familiar with a Trend T-11, the product should list all routers that will fit the unit. If not, contact Rockler. Can I make a 9cm Circle or less, with this article ? I have a craftsman router model no. 320.27680. Will 27712 circle jig fit? BEST ANSWER: You will have to drill new holes to hold the craftman router. Will this fit on my Porter Cable Model 7539 Plunge Router? BEST ANSWER: Hey Daniel, this jig will only fit on routers with a 6 inch base and I believe the 7539 porter cable has a 7 inch base hop this helps. Will this cut an arc 42 inches long that rises 1.5 inches in the middle?